"Campaigners fear that vast swathes of the British countryside will soon be green in name only after being paved with solar panels. Solar farms were intended to plug a gap in the government’s renewable energy policy. They attracted generous subsidies for landowners prepared to sacrifice their fields. However, the rush to cover the countryside with photovoltaic panels has alarmed conservationists, including the Campaign to Protect Rural England, which claims that vital agricultural land is being given up unnecessarily and could present a “back door” for housing development. Today the CPRE will urge the government to encourage solar parks on the south—facing roofs of factories, offices and shopping centres, but not on fields where crops could be grown. It claims that an area twice the size of Greater London is available for solar panels without encroaching on the countryside. Plans for nearly 200 solar farms are under consideration, despite the government’s intention to remove subsidies for large-scale developments from April 1. There are 15 solar farms approved or seeking planning permission within six miles of one small Wiltshire town alone. The CPRE is also concerned that agricultural land could be redesignated as “brownfield” when the agreement for a solar farm comes to an end, typically after 25 years. This would open a back door to development that planners could find hard to challenge. The CPRE’s policy document published today says: Planning conditions should require that solar sites continue to be classified as agricultural land throughout their life. CPRE believes that high-quality agricultural land should not be used for solar farms. This reflects the growing importance of food security. Although the CPRE and the National Trust welcome the development of green energy in principle, they are concerned at the environmental impact of solar panels. The CPRE warns that security fencing and lighting around solar farms is disturbing wildlife as well as being a visual blight. Nick Clack, the CPRE’s senior energy campaigner, said: An area at least twice the size of London is available for solar electricity on commercial roofs and brownfield land unsuitable for housing. But the government needs to do much more to help realise this massive potential. Our guidance doesn’t rule out solar farms, but it does say they should meet criteria on protecting landscape and heritage, the best agricultural land, and maximising biodiversity. The government has already indicated that it has more than enough solar energy in the pipeline. Subsidies of up to £1,000 an acre for the next 25 years have been taken up by the owners of more than 17,300 acres of England. Plans for a further 9,500 acres of solar panels have been submitted. According to the CPRE there are 15 solar farms planned within six miles of the Wiltshire town of Melksham alone. The stigma of nimbyism and a reluctance to be seen opposing green energy have made it difficult for some opponents to speak out, but in May the actor and comedian Griff Rhys Jones led a successful campaign against a £25 million solar farm near his home in Suffolk. 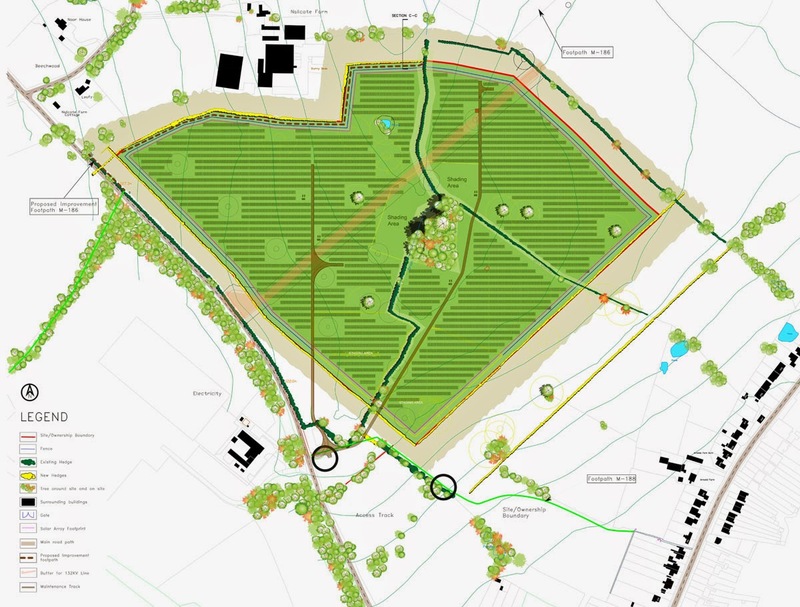 The scheme was rejected by a planning inspector who said it had not been demonstrated that it was necessary to build it on productive arable land. However, the Solar Trade Association is determined to fight back. Next month it will challenge in the High Court the decision of the Department of Energy and Climate Change to withdraw subsidies from new farms generating more than 5 megawatts." The next meeting of Burton Green Parish Council will be held on Monday 18 August. A Public Meeting has been arranged at the Village Hall, 7pm on Friday 15th August. A presentation will be given explaining the case against the proposed development. Green Energy has submitted a planning application to Solihull Borough Council. A decision is expected within 5 to 6 weeks. 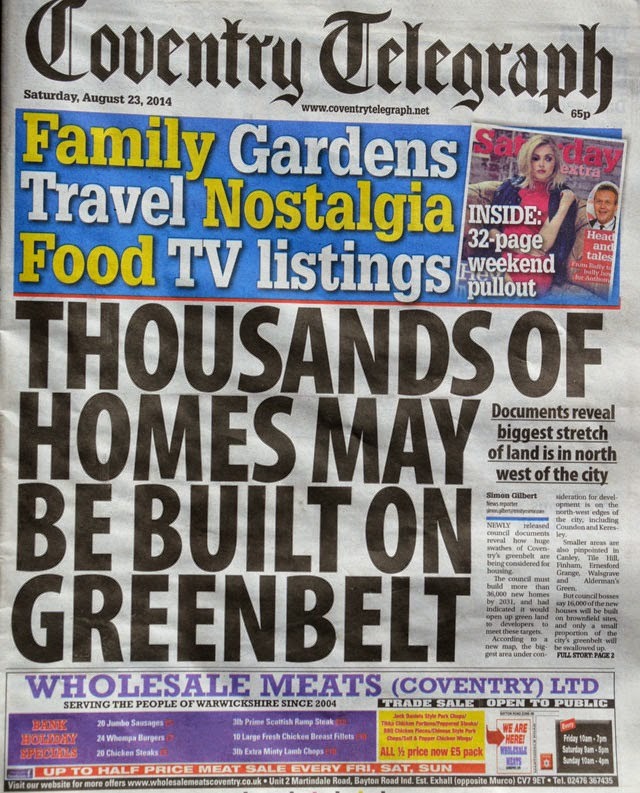 Comments to Solihull Council must be submitted by 28th August. The Parish Council has received an update from Green Energy. Green Energy has also informed the Parish Council that they have submitted their planning application to Solihull Council. There is usually a period of 7-10 days before it is verified and shows up on the council’s planning portal. We will be looking out for the full details when they are available. The Parish Council will be meeting on 18 August to consider our response to the application. 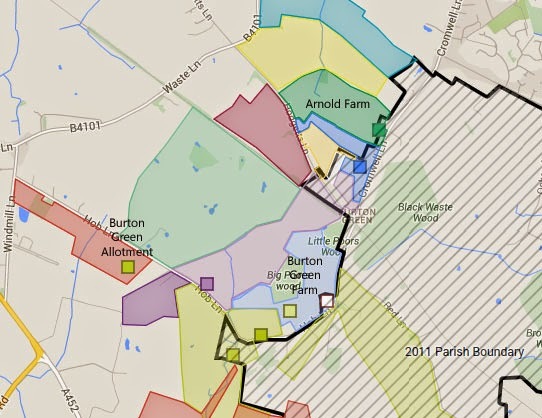 The Burton Green Parish boundary was drawn up in 2011. Much of what is historically Burton Green was not included in the new Parish. Some of the farms along Cromwell Lane and Hob Lane have their houses inside the boundary, but most of the land that was part of those farms lies outside the boundary. The boundary makes a detour inwards, precisely to exclude the land of Burton Green Farm! Does it make any sense for Crackley Wood (2 miles to the East) to be part of the Parish of Burton Green, when Arnold Farm and Burton Green Farm are not? Burton Green Parish Council really ought to have sole planning jurisdiction for the land behind the houses in Cromwell Lane. A jet washer was stolen from a driveway on Cromwell Lane, 4pm, Tuesday 9th April. Two men were involved, one of whom distracted the owner of the jet washer under the pretext of requiring help with something along the road. Two silver or blue vans are believed to have been involved. A large planter was also stolen from the front of a house on Cromwell Lane at the weekend. Tuesday 14th May 3-5 pm (2nd and 4th Tuesday of each month). Come along for help with your technology questions or just for a chat. 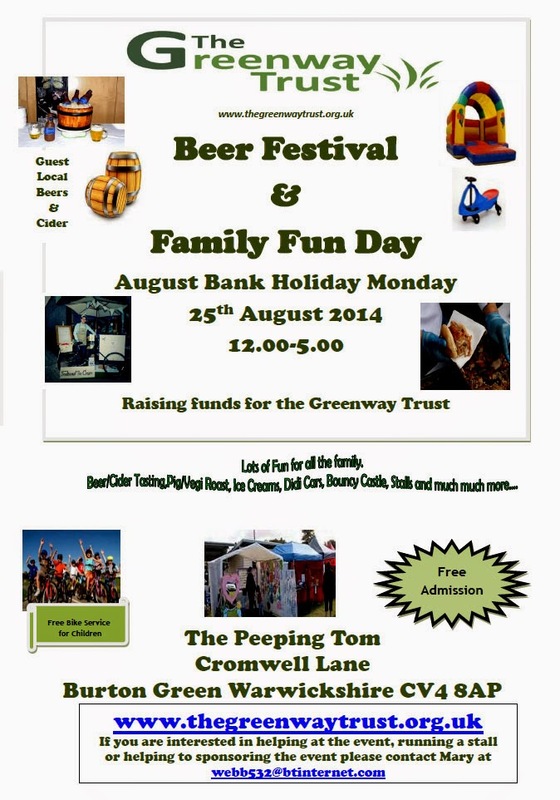 £3 to include drink and a cake. Between 9am Sunday 3rd February and 9am Thursday 7th February offenders have entered the garden of a property at Red Lane, Burton Green, Kenilworth and stolen a Beehive and a garden bench.